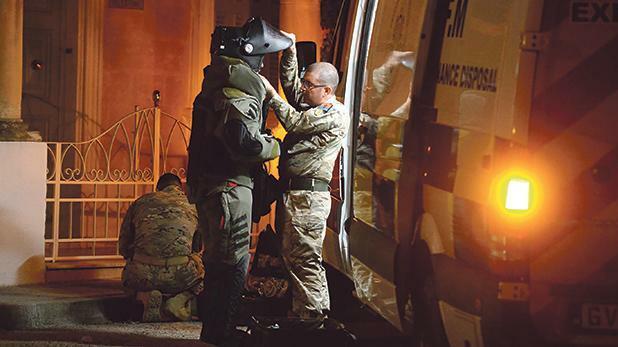 The bomb disposal squad close to the scene of the Balzan burglary on Friday. A handyman who on Sunday admitted in court to stealing €16,000 from his employers has been handed a suspended sentence and is also facing repatriation. Amadeo Montilla Manalo, 44, from the Philippines told the court that he stole the money to finance a gambling addiction but had returned €12,500 and pledged to return the remainder. Mr Manalo was arrested on Friday after discarded items from the robbery led to the bomb disposal unit being dispatched to investigate a suspicious package. During the man’s arraignment, Inspector Roderick Spiteri told the court that the accused had been cooperative and had shown genuine remorse for what he had done. Mr Manalo had returned €12,500 of the stolen money, which was the amount left after a one-night gambling spree. He pledged to return the remaining €3,500 as soon as he could find work. In his judgment, Magistrate Joe Mifsud after noting the man’s guilty plea, quoted the Court of Criminal Appeal in saying that punishment should not be a form of revenge by society against the accused, but to repair the damage caused, reform the guilty party and protect society. He noted that the accused was in Malta on a renewable visa and lacked a place to live or means to support himself. His sister was employed by a Maltese family with whom she lived and therefore could not offer him accommodation. Mr Manalo’s crimes were serious because the family he stole from had for many years, accepted him into its home, offered him work with good conditions and accepted him as part of the family. He observed that case law had established that suspended sentences should be the exception, not the rule and should be given when the court felt that a prison sentence was not ideal. “In other words, there must be special circumstances… to make this exception,” Dr Mifsud said. In this case, there were circumstances which gave reason for such an exception. He therefore condemned the accused to two years’ imprisonment, suspended for four years. In view of the fact that the accused had been in Malta on a temporary visa, had no place to reside and lacked the means to support himself, the court also asked the Principal Immigration Officer to make the necessary arrangements to repatriate the man back to the Philippines.